As I sit back in comfortable Brighton a couple of days after returning from Calais – the “Jungle” is feeling more and more like a bad dream. This, I’m sure, is natural. But I refuse to allow this to happen – it’s a coping mechanism that I will try to resist. Those that have to live there every day they are experiencing this existence on a daily basis. It’s a recurring nightmare of disappointment, violence, desperation and fear that we over here can only imagine with, unfortunately, no end in sight for those in the camp. This is a reality and an experience that has completely altered my perspective on the importance of art, politics and culture as a whole, and one I wanted to write down for others to experience without necessarily having to go themselves. This is not a fear of not getting that promotion, the fear of living at home or not “succeeding” as most people in the UK suffer from. But a fear that you may not survive, or in some cases that they will. A fear that you can feel fizzing in the air like an incessant wasp that occasionally penetrates your psyche with particularly sharp pangs of anxiety when you’re confronted with yet another unfamiliar sight or experience that again questions your very presence in the camp. It’s hard not to be moved, even just by the atmosphere of the camp, and its stark contrast to the relative familiarity and ordered nature of Calais just a few kilometres away. “The Jungle” as it was named by its residents – Please note: I use that word with reservation, as “resident” gives a semblance of comfort that these people can only imagine – is as close to purgatory as can be. It’s a state of transition where borders are permanent but ever transient in the refugees’ mind as they are not allowed to be part of either the UK or France. Our governments have shamefully turned their back on those most in need, fleeting for their lives only to find that they’re not wanted by France or the UK. Last Monday it was Eid, the end of a period of fasting after Ramadan that families usually spend celebrating together. I spent it with 10,000 others in the Jungle, specifically with the Hummingbird Project, set up by Elaine Ortiz a year ago to provide a safe space for under 21 year olds to create artwork and talk, and also with Emily from Articulate, an art therapist who volunteers with the charity and was providing the workshops in Hummingbird that week. This was my first visit, and I don’t know if it will be my last or not. On the way to Calais, Elaine said that the children will probably not say too much about their experiences as they can suffer from trust issues (obviously) and probably need to build up a relationship with a new person. Mentally prepared for a pleasant day making art and talking football I walked in with a naivety that in hindsight probably gave me the strength and positivity needed in the space. Monday was different though, for a combination of different reasons: people were served with an eviction notice on a day where they missed their families, provoking a particularly intense day. I heard stories that made me physically sick and completely change my perspective on life and privilege forever. Names have been omitted to protect the children and preserve the safe space element of it, but I’m sure every single resident in the camp has stories similar. F, 15, comes from Eritrea. He was given money by his family to travel to safety in the hope that he would be able to parachute them to safety once he was in the UK. He traversed Africa through various methods before joining a trafficker’s boat in North Africa to cross the Mediterranean. He survived for 12 days on this boat, watching people jump into the sea as they gave up. F survived on sea water for more than half of the journey. “Have you ever tried sea water?” he asked me. “Once, some fell down my throat on holiday and I threw up instantly…” I reply. He had been in the Jungle for only 2 months and is determined to reach the UK. He loves this country and yet has never been here, he’s willing to give up everything and risk his life trying to jump on moving trains to reach the UK, rather than on lorries – a common method, with it’s own risks. “Isn’t that more dangerous?” I ask. “Well yes, more risk, but one jump – [whooshing noise and gesturing with his hands and a smile] - straight to UK,” came his reply with a huge smile. Even after everything he has gone through his love and happiness is overwhelming, a huge grin, a willingness to make people laugh and a truly great sense of humour is not uncommon in the Jungle especially amongst the kids, but his attitude of positivity was rare. Almost immediately I knew what she meant. A 17-year-old who has been in the camp for about a year had just been disappointed yet again by the French government, who had arrested and held holding his friends in a deportation centre after the police insisted that they would be back to him in just a few minutes. His anger and this final disappointment took him to breaking point as he lashed out on the shelter and shouted at us. I was lost for words. Why am I here? To see the ‘other side’? I thought I came to help, but how much help am I really? Again Elaine steps in and allowed the boy to vent, calming him down and reassuring him and re-explaining what Hummingbird is there for, that the art is just a facilitator to allow conversation and to help the children. She took him back over to the legal centre to re-examine his own case and allowed him to use her phone to ring his friends in the deport centre. Meanwhile, Emily was somehow keeping control and the calm on the other side of the tiny room for the other children, asking questions and keeping conversation flowing. It was amazing and overwhelming at times. The professionalism, the kindness, the humanity of it all as Elaine and Emily helped child after child come to terms with their place, provide an escape, and most of all make them laugh and smile, somehow. The Jungle is a strange and uncertain place, it has no security service to speak of. No police or army. Instead Hummingbird has a group of Afghan angels (yes, that’s my name for them, deal with it) who protect the building from gangs and risk their lives to provide a space for children to talk and feel safe. Meanwhile videos of the subsequent “evictions” showed a different side, riot police, fires and tear gas all reported. During the tour of the camp Elaine told me how notices of eviction were initially passed through the camp via word of mouth passed on by the volunteers. This made their position difficult as it gave the impression that “we worked with or for the French government which couldn’t be further from the truth.” Thus, when they challenged the eviction with an appeal they ensured that the police had to notify residents with themselves, and groups of “5 or 6” volunteers from various groups followed the French authorities around from shelter to shelter to ensure that there was no intimidation tactics committed against the residents. Since then, when Help Refugees put the camp’s population at 5,000, the camp has doubled in size, proving that evictions is not only a destructive and traumatising experience for those being evicted, but the idea of it being used as a “deterrent” is laughable. (Source: Help Refugees Census September 2016). During the eviction there were near 400+ children that have gone completely missing from the camp and never heard from again. This could mean they are in other camps, other countries, in the hands of gangs or traffickers, or dead. These young people are unaccounted for due to the French and British Authorities not recording or tracking these children, trying to locate them can be impossible. Refugee Youth Service, a grassroots group have now developed a monitoring and tracking system and register their young service users. A job you would expect of a multi-million pound aid organisation. But these are people who came to the camp as volunteers. 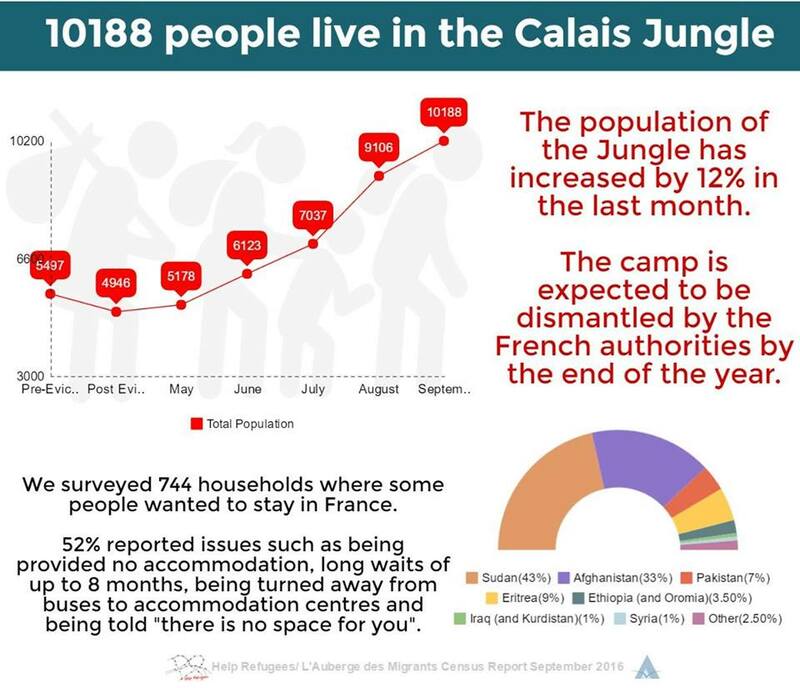 When it comes to the situation in Calais, having visited and done lots of research and past reading about the camp there is no doubt in my mind where the failures of the camp lie, and in no way is it with the refugees. Both the UK and French governments provide no help at all (save those concessions made that I will talk about later). Provide a heavy handed police force (to put it mildly). Provide no protection for minors at all to a point that they have ignored requests most recently from Hummingbird for a consultation for a deaf boy who was stabbed from behind as he couldn’t hear his attackers. “Nope, not our problem” comes the indifferent response of a Child Protection Service. Instead Medicins sans Frontiers (Medics without borders) provide healthcare and information in the camp, with charities such as Hummingbird, Care 4 Calais, and other small charities providing support. One of the main reasons for this is because of its status. Technically the jungle is not a “refugee camp” as there has to be a minimum standard of care (take a look at this report from a refugee camp in Kenya in the “minimum standards” section) from the government that the jungle falls well short of, instead it is referred to as a “tent camp”. This means that large charities like the Red Cross and Save the Children are not really present within the camp as you would expect. Finally this also puts a huge amount of strain on those small charities and the team of volunteers that help to run it. Normal rules of care are thrown out of the window as the phrase “above and beyond” truly comes to the forefront. From start to finish all 3 of us (Emily, Elaine and myself) took care of the children and each other with such intensity that afterwards I have suffered from relative burnout and actually have strangely missed the intense bond that you form. On a larger scale this is seen within the camp as small improvements as volunteers fight tooth and nail for basic concessions: sand and stones placed in the camp to stop the build-up of mud, basic rubbish collection dumps and collections, toilets and more than 2 water taps (which also isn’t infected with E.Coli, as was the case only a few months ago and finally, containers for women and children to sleep in. Ok, so there is no protection of these containers and there is very little stopping people from walking in at any time to mug, intimidate or attack them (as the children reported whilst we were there), but one step at a time. This last fact is important because it also means that children have been reporting camping 2 or 3 hours away from the camp in woodland to protect themselves from others within the camp as they feel safer there. So this really has been written in quite a light-hearted way because I can either laugh or cry about this situation and really I have done enough of that these past few days. The fact is that these children are being failed by our governments and by allowing this to continue we are cultivating a breeding ground of discontent against the UK and France that can only lead to worse things in the future. We must act now and ensure that we are not looked back on by history and been the "generation that should have done more." It is time for the various UK and French governments to act and you, the person reading this can help to make this happen. Write to your local MP, sign up as a foster carer, sign petitions and put pressure on your government to change this, even just spreading the word can help. In the meantime any donations to Medicins sans Frontiers, Hummingbird or any of the other charities in the camp is always welcome. Regarding clothes, as it is getting close to Winter time there will be people in need of clothes, but please be reasonable – no XL or XXL clothes (these people are not on camp), and no dildos or gold tutus. You can find links to drop offs and help below. A final word from me. I don’t know if I’ll be back next month. But if I do, I hope to see some of your stuff there.